The eS-WiFi family of module products has a powerful built in SoftAP function that allows customers to easily command the eS-WiFi module to join a network for the growing number of machine-to-machine (M2M) and Internet-of-Things (IoT) applications in the home and in the enterprise. The eS-WiFi modules are wireless LAN modules that are typically embedded into devices/appliances that connect to home networks, Wi-Fi hot spots, and workplace networks. These devices operate as a station (STA) which can connect to a single wireless router/access point (AP) that is typically hardwired at a fixed location. 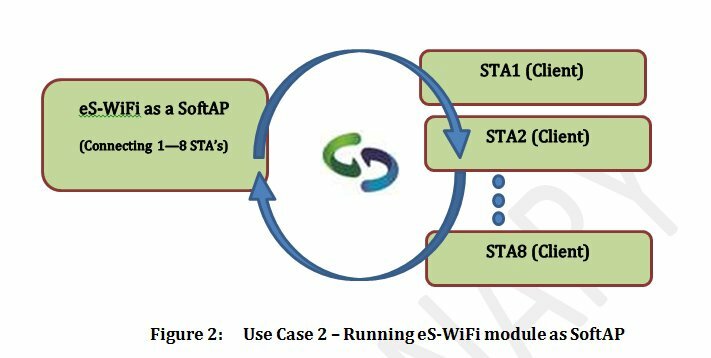 The eS-WiFi family of 802.11 b/g/n modules have an embedded microcontroller running a fully integrated TCP/IP stack and a simple to use AT command set. One of the features described in this application note is the implementation of a Soft Access Point (SoftAP) technology which enables an eS-WiFi module to behave like a wireless AP. The Inventek eS-WiFi modules are offered with a complete TCP/IP stack and require only a simple AT command over the USB, UART or SPI interface to communicate with the module. In a typical embedded application, a simple 8/16/32 bit microcontroller is used to send the AT command to initiate a SoftAP. Once the AP is started other devices (users) can join the network and be connected as a client on that network. You have an embedded product and you want to configure that product to join a network (See Figure 1). One way, to make this happen, is to have the eS-WiFi automatically power up as an Access Point. The user can use a PC, tablet or any smartphone to view the AP and type in the SSID and Password. 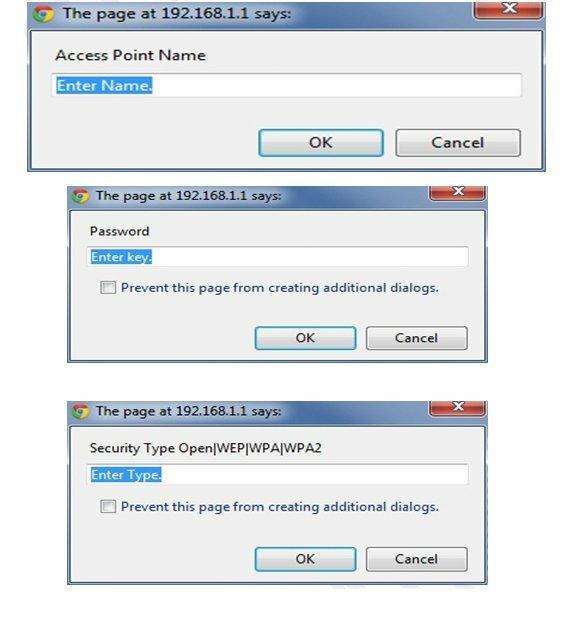 After the user, selects “Join” the Access Point is closed and the eS-WiFi module subsequently turns off the AP and joins the network as a client. i. Access Point is activated. iii. Web server is activated. i. Access Point shuts down. The module has now joined the selected network as a client/appliance device. The user also has the ability to manually enter the information to join a network as well. 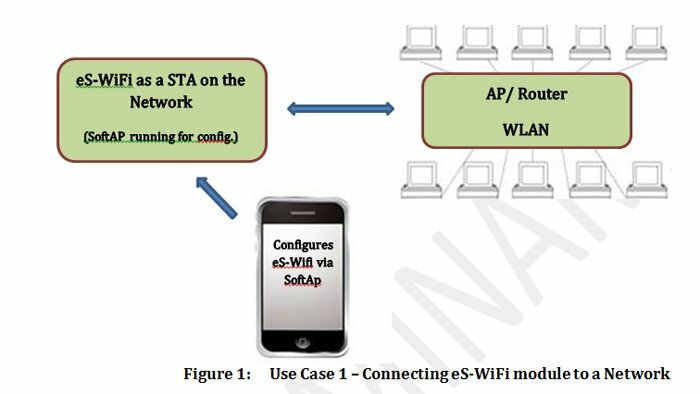 You have embedded the eS-WiFi module into a printer system or interface box and configured it as a SoftAP that allows smartphones/ PC’s and other devices to make a “Direct Connection” via the eS-WiFi SoftAP function (See Figure 2). The SoftAP enables file transfers, file sharing, printing, and information exchange between as many as 8 clients (STAs). This is all accomplished without the use of a fixed AP. One way to facilitate this senario is to have the eS-WiFi automatically power up as a SoftAP that a user can view using a PC or any smartphone and selects “Direct Connect” on the eS-WiFi SoftAP web server. 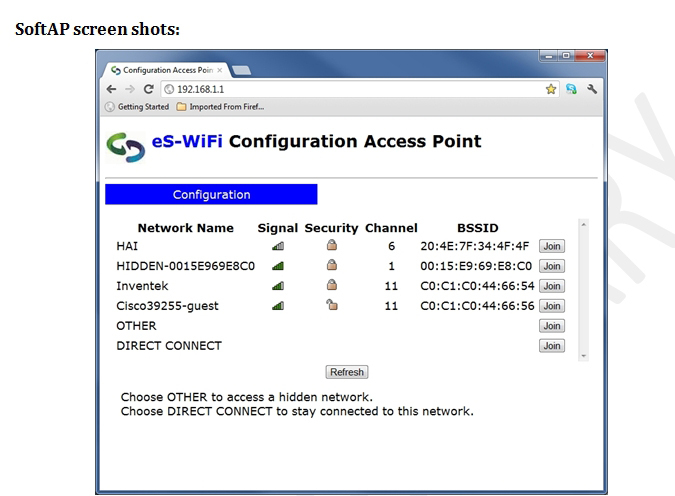 As soon as the user selects “Direct Connect” the Access Point remains running and the client (STA) is connected to the eS-WiFi SoftAP. This allows WLAN devices to easily connect without the need for a fixed AP and supports WiFi M2M communication and ON-The-GO connections for printing and file sharing. i. Access Point continues to run and manage the SoftAP. ii. DHCP continues to run. iii. Web server is shutdown, but SoftAP remains visible. Multiple clients may now connect to the SoftAP.